Valentines day is fast approaching us and for the many of us, getting to the shop is actually quite difficult at the moment due to work pressures, having a family or being unable to leave the house. this is where http://www.nudge-me.co.uk/ comes in very very handy. 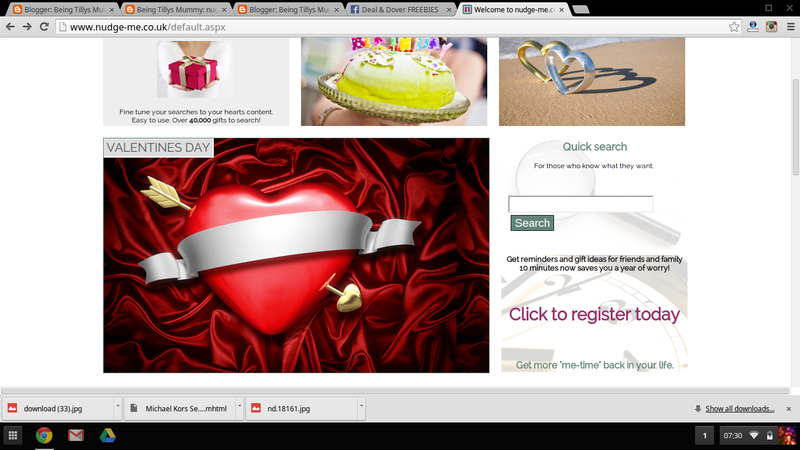 it is a website designed to help you find the perfect gift for your loved ones. Finding gifts for your loved ones is easy using the gift finder as you can put in the details and it narrows down the gifts to that person, meaning you dont have to go through pages and pages of gifts. 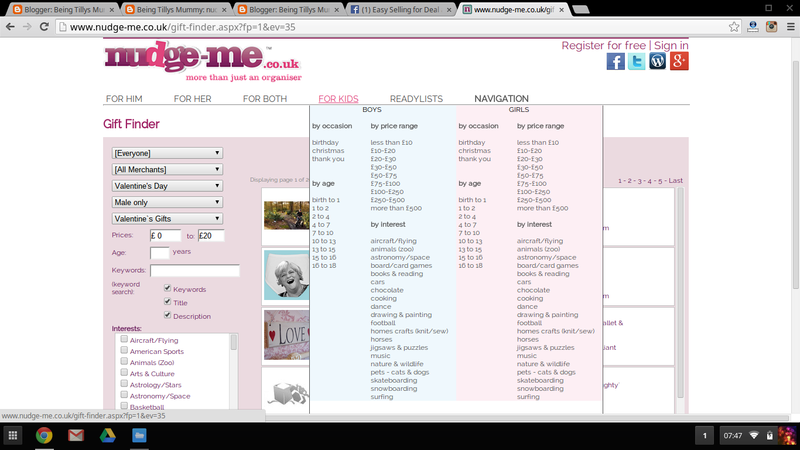 You also have the option of searching for example a ladies gift, then click on valentines day and then, £10-£20 and it brings up all the gifts they suggest and where you can buy them form. You click the link and it takes you to the webpage and you order its simple and so much easier than searching the different websites one by one. but please make sure you leave enough time for delivery in time for the special day. There are also other options to buy gifts for other special occaisions such as birthdays and christmas. All you do to shop for a gift for a child is click on the drop down bar where it says 'for kids', then it offers you the option of boy/girl, age, budget, occaision and their interests, what really could be easier? 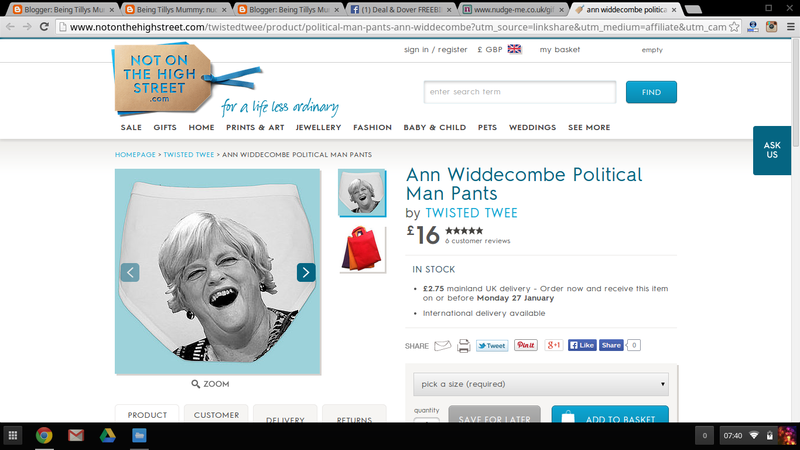 next year i think i may just make my xmas shopping a bit more stress free by using this website more for a one stop shop! 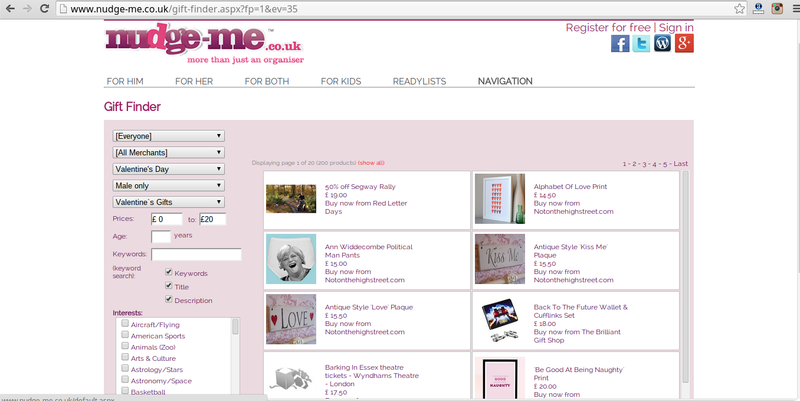 Nudge-me is free to join which is a bonus for a stress free, more organised life your about to get, and they work in partnership with many different varieties of companies too, so your going to get a good selection of gifts.